Vladimir and Olga, siblings reunited after a year apart! It was quit the scene on Maida's porch! She starting feeding a couple of stray cats that wandered over from the next door farm during the winter. Come spring she got a surprise -- 14 black kittens! Maida reached out to BDRF at the end of summer and we came to see what we could do. We had to act fast because the kittens were getting older and more skittish with every passing day -- making them less and less adoptable. 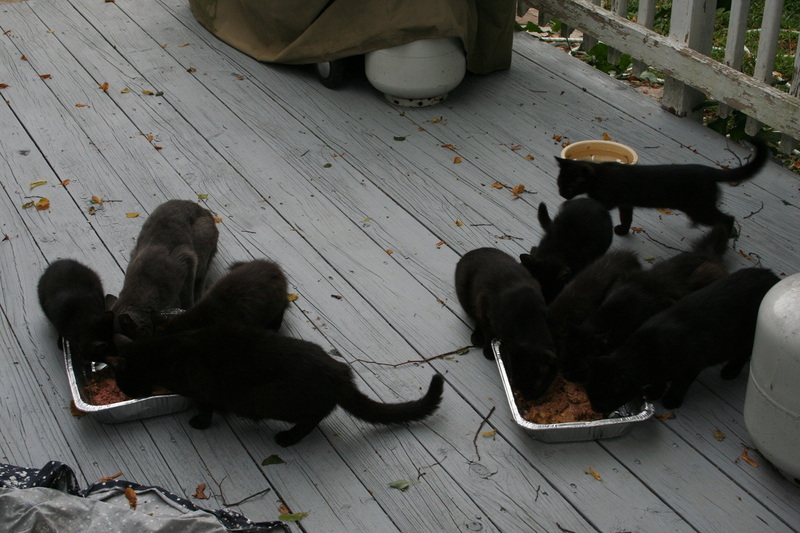 Over the course of a couple of weeks we managed to trap all 14 kittens and get the adults spayed and neutered. Tyler (AKA Vladimir). Both kittens were about 5 months old already and were very skittish. Olga came around quickly and although shy, she was an affectionate and friendly girl. Tyler was semi feral but not aggressive. He needed some work. Tyler's foster mom considered him the "coolest cat" she'd had and she went to work trying to win his trust. adopter, Brian. Brian had fallen in love with Olga from her photo. He was looking for a companion for his aging kitty, Gypsy. Brian adopted Olga and after a short time she was becoming a great companion to both Gypsy and Brian. Tyler started to come around to his foster mom, still unsure about being picked up and definitely not approachable by strangers. But he had a great personality and just needed the right home. A year passed and no one was interested in Tyler because of his shy nature. background. I told him that Tyler was actually Olga's brother. Brian has a calm and accepting way about him, perfect for shy cats, so it wasn't a total suprise that Tyler allowed Brian to pet him, Brian wanted to give him a try. Vladdy is now becoming a good friend to me. He is still a little mercurial in his responses, e.g., he may hiss if he is frightened, but that is happening less and less often. The rapport between Olga and Vladimir is glorious to behold! They usually spend most of the night playing together. 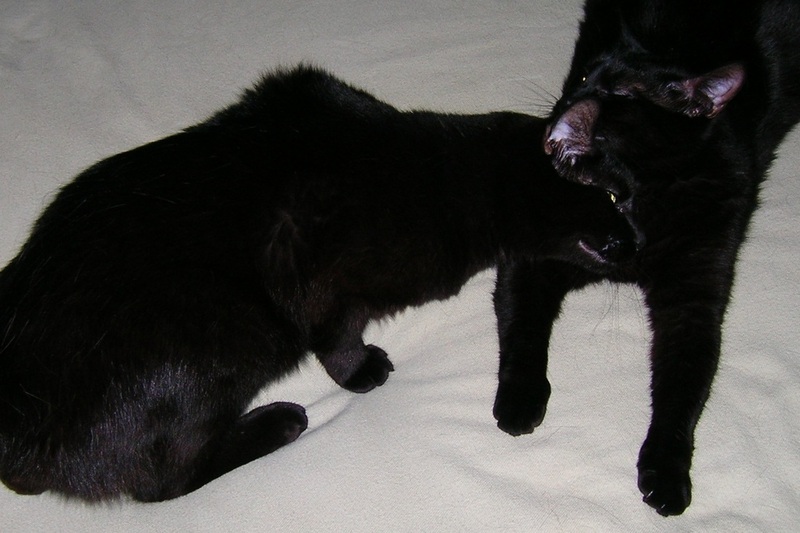 Olga loves to groom her brother. She may now be the world's happiest cat!" don't know they are siblings but I believe they do. I believe they have a bond and their own indiviual scent that is recognizable between families. 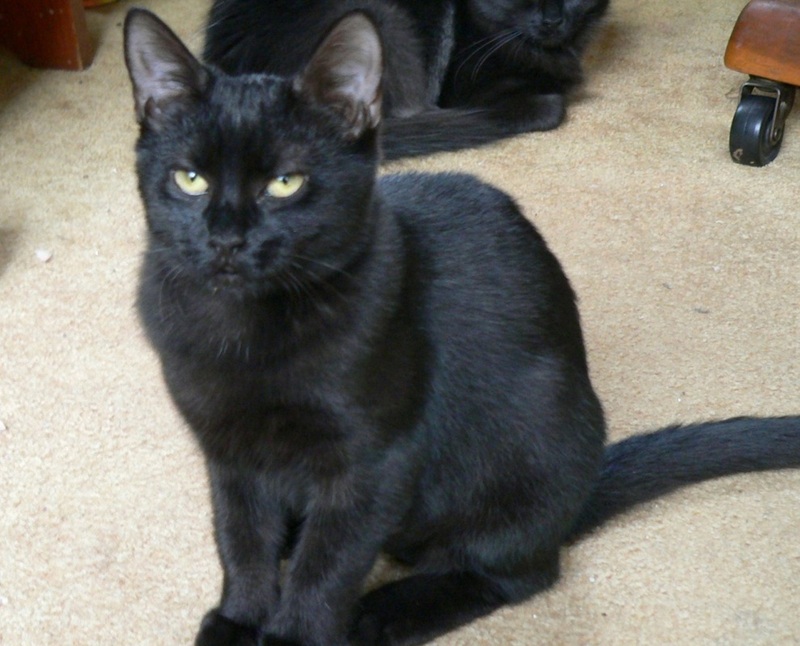 No matter what you want to believe it couldn't be a happier outcome for two unwanted farm cats!